As waterfowl hunting kicks off in September throughout much of North America, it’s as good a time as ever to go over some common tips for training a hunting dog. A well-trained retriever is every duck hunters dream. We all want a dog that behaves well and brings those birds back without a hitch, but it takes time and patience to properly train a gun dog. Brad Higgins of Higgins Gundogs trains hunting dogs professionally. His unique training program utilizes some specific equipment such as a Bang Machine and the Higgins Remote Releaser, but above all the method simply develops the dog’s natural instincts. With little to no commands, dogs can learn to retrieve birds in as little as a week. Whatever method you’re invoking, there are common aspects to all gundog training. Higgins offers the following 14 tips for any beginner. Dogs are pack animals. Be the leader. 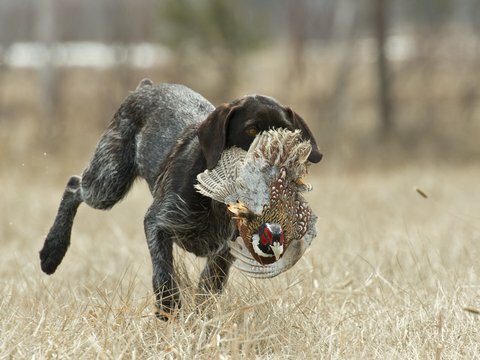 It takes birds to train a bird dog (no birds = no bird dog). Quality dog work is not between you and your dog. It’s between your dog and the bird. Let your dog learn to manage the bird. Don’t teach whoa around birds. Whoa has nothing to do with birds. When working birds, your dog has not made a mistake until he puts a bird in the air. The dog must know what the command means before he can be corrected for mistakes. An electric collar is not used to teach a dog to perform a command. It is used when the dog has a complete understanding of the command and chooses not to do it. An electric collar is for reinforcement only. Give the command once, don’t raise your voice, and always use a release command. Never give a command you can’t or won’t enforce. If you ignore or don’t correct for an unwanted behavior, you are agreeing with and encouraging that behavior.